One way engineers deal with stormwater management, and cut down on the amount of land needed for drainage, is by installing an exfiltration system. 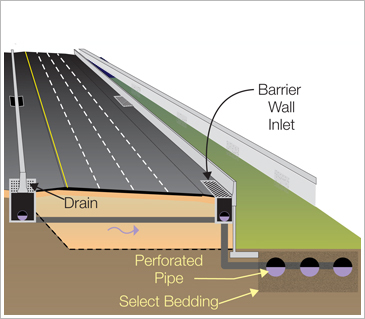 Drains flanking the highway allow water to enter perforated pipes under highway shoulders. Water then seeps down into gravel bedding surrounding the pipes. Exfiltration systems allow stormwater to be managed without using the added space and taxpayer dollars needed to construct additional stormwater ponds, and help naturally recharge the ground water aquifer. FDOT plans to use exfiltration systems to address the increased drainage requirements needed to widen and expand I-4 in the coming years. The spaced saved will be used to provide enhanced landscaping to areas of the I-4 corridor.